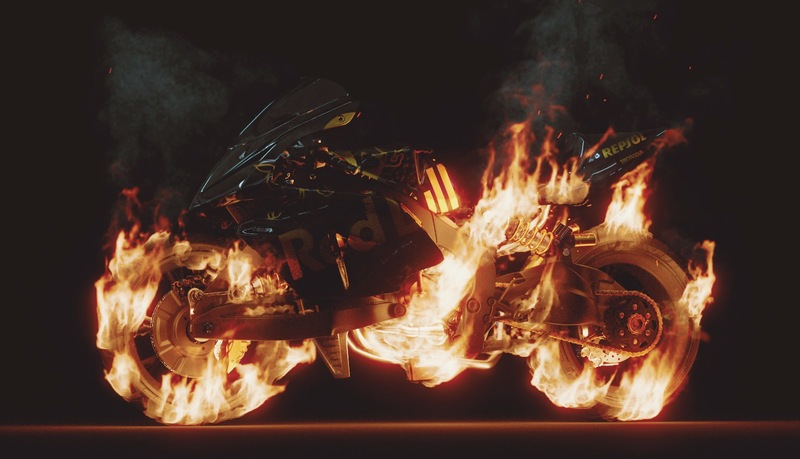 In this article, I am going to show you some of the critical steps of making this burning motorcycle image with Phoenix FD. The model was kindly provided by Lien Ying-Te. Though this is a sub-D model, there are a lot of parts and faces in the geometry. The first thing I do is attach all the pieces into one single mesh, and then use ProOptimizer to reduce the polyfaces to roughly 10% of its original polycounts. You get a significant simulation performance increase when you have fewer polycounts as a fire/smoke source. The next step is to determine which parts of the motorcycle to be burned. 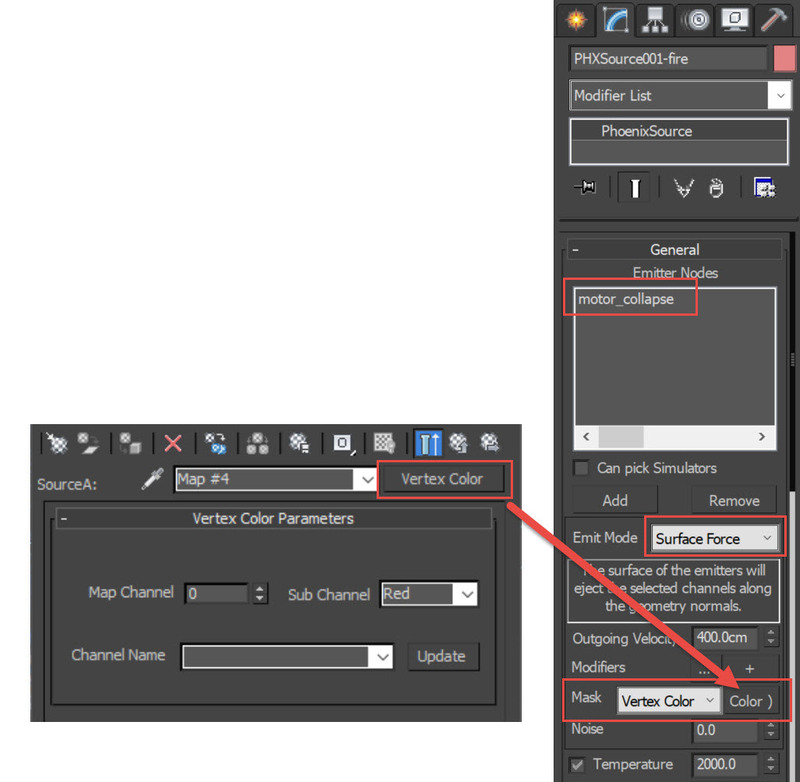 I prefer using vertex color as a mask to control where the geometry emits fire/smoke. 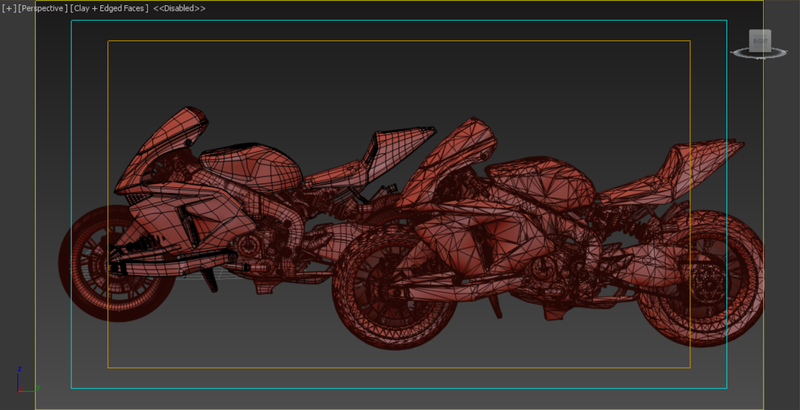 So I add a VertexPaint modifier to the low-res motorcycle model, and then I paint the faces of the tires and the motor engine white. You can find the same technique explained in details in this official tutorial page. 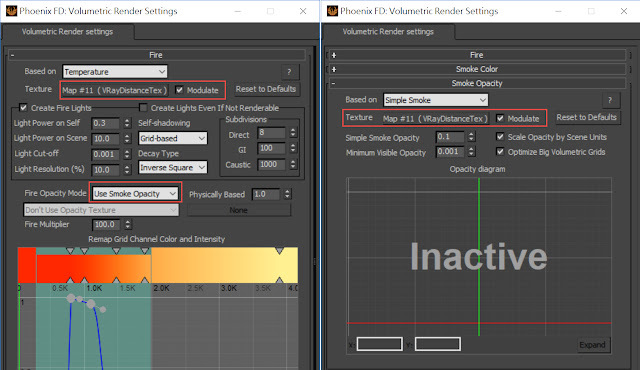 Now create a Phoenix FD Fire / Smoke source in the scene, and add the motorcycle (motor_collpase) in the emitter nodes list. For the Mask, use Vertex Color texture. If you simulate the fire with Phoenix FD Simulator, you may get something like the upper left image. Notice that the "root" of the fire looks ugly and unrealistic. How can we get a smooth fire transition like that in the image on the right? The answer is in the Phoenix FD Volumetric Render Settings - fire/smoke modulation. Check the Modulate option. 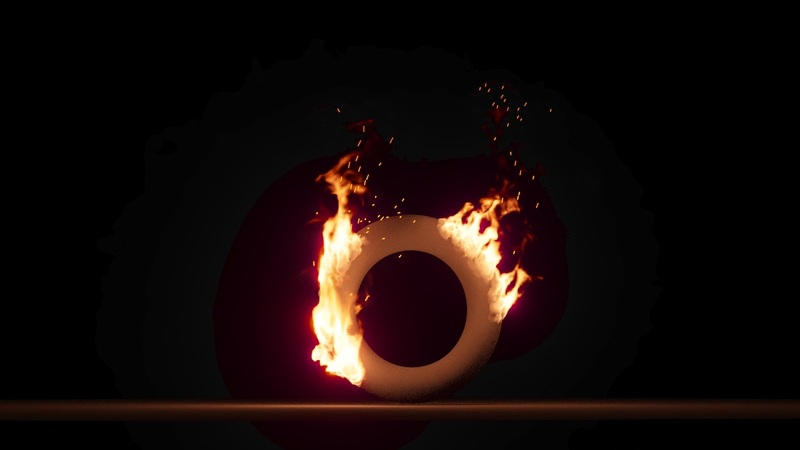 Put a VRayDistanceTex in both the Fire and the Smoke Opacity Texture slots. 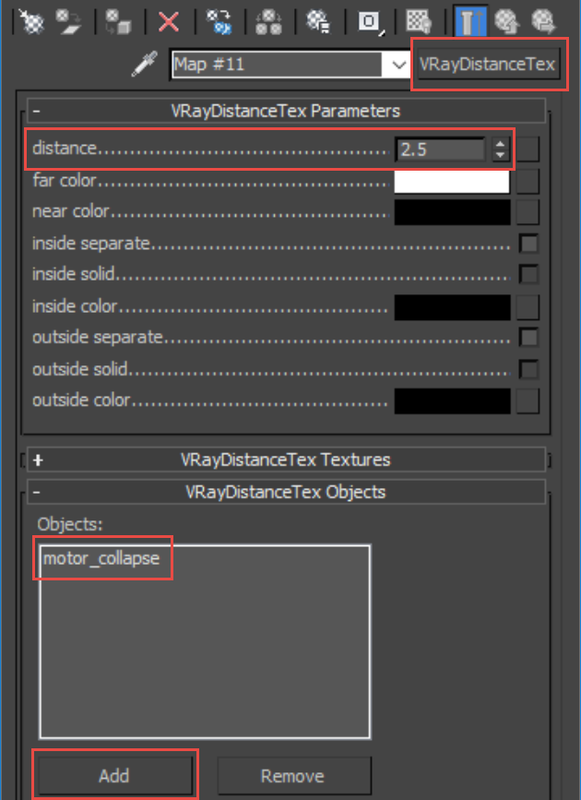 It is a V-Ray specific procedural texture that returns a different color based on a point's distance to an object(s) specified in a selection list. 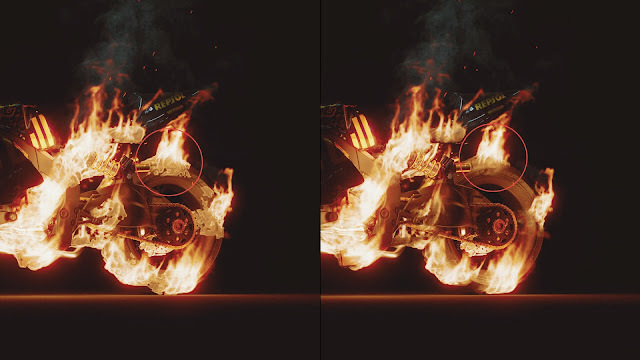 Simply put, the part of fire that is closer to the motorcycle geometry will have less opacity. We can use this texture to alleviate the "root" artifact in the fire. 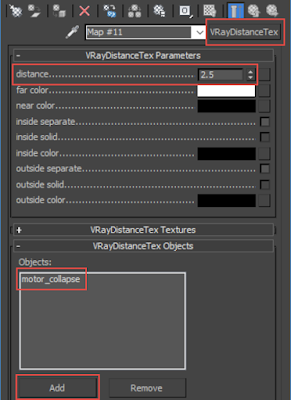 The image above shows the settings for the VRayDistanceTex. Add the motorcycle geometry in the Objects list. The distance can control how far the transition will be. In this case, I use the value of 2.5. Too complicated? Don't worry. I have made a simplified version of the scene, click Here to download the 3dsMax scene. Hope you like this post. See you next time!